As it happens, I confess, I myself have a blind (mute?) spot when it comes to classics: I have an aversion to watching silent films. Indeed, I can’t remember the last time I’ve watched one – possibly Chaplin’s dramatic feature A WOMAN OF PARIS. (And I’m only talking about non-comedic silents.) Maybe it’s traumatic memories of watching hours of BIRTH OF A NATION and HEARTS OF THE WORLD, but I can’t bring myself to watch any of these films today and, frankly, never even think to try. 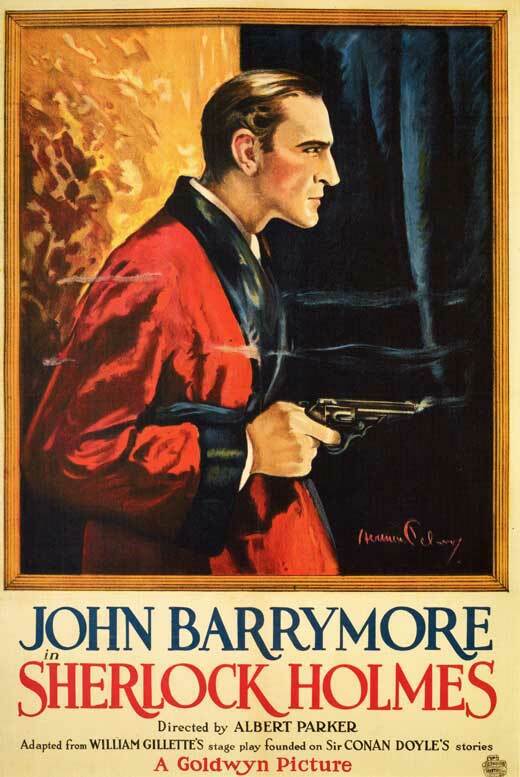 So I approached TCM’s recent airing of John Barrymore’s 1922 silent version of SHERLOCK HOLMES with trepidation, suspecting I’d delete it from my DVR queue shortly after I started watching it. To my surprise (and modest shame) I was completely engrossed. I loved watching this and may well again, as well as giving a shot to other silent offerings. 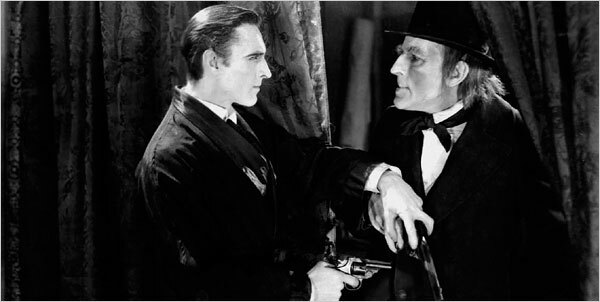 Robert Downey Jr. wasn’t the first American star with a bad-boy reputation to travel to England and take on the role of the famed sleuth, legendary stage star John Barrymore did it as well. The film is based on William Gillette’s romantic stage melodrama that was a sensation when he himself toured in the part for many years. The play is based loosely on some aspects of A Scandal in Bohemia, but also pulls from the few stories that actually feature Professor Moriarty. This adaptation opens the play up and does a really smart job of fleshing things out with an opening portion that takes up half the film and all occurs before the play’s action begins. These scenes show the detective as a student at Cambridge and have an almost sepia-YOUNG SHERLOCK HOLMES feel to them. A vignette of him making notes in his journal as he takes in what goes on around him, has a warm and mellow tone. Also these passages introduce Holmes’ love interest much earlier than Gillette does. It makes more sense, and an attraction that’s off-puttingly abrupt in the play is now made plausible. And Barrymore is marvelous in these early scenes as he is throughout. He is completely magnetic and, frankly, gorgeous. Even in his Hollywood heyday in talkies like GRAND HOTEL, he seemed to have a slightly dissipated air of the debauched roué. In this though, he’s plausibly young and conveys a youth’s opening up to the world around him nicely. Later, he’s effortlessly commanding and relates Holmes genius and daring with wry, ironic wit. It’s strange to reflect how much he communicates silently. You’d almost swear you hear him speak. The picture has a marvelously kinetic pace to it; it moves with briskness that you rarely get in early talkies, which, of course, makes sense, as the exterior scenes aren’t hampered by any recording constraints. The production design is wonderfully moody and atmospheric and evocatively shot. Also, and this may be standard for silent films – I don’t recall, but the plot is rendered not just in title cards but newspaper articles, letters and journals. This adds an agreeable texture. There are also some terrific establishing location exteriors. For a film from such a bygone era the cast has a number of recognizable faces and names. Watson is played by Roland Young who many will recognize from the title role in TOPPER or as Uncle Willie in THE PHILADELPHIA STORY. One of Holmes and Watson’s fellow students is played by a very young William Powell! Also in the cast are Reginald Denny and the legendary gossip columnist Hedda Hopper. The actor playing Moriarty is done up in ghastly, hideous make-up that looks a bit like what Barrymore himself donned as Mr. Hyde. I wasn’t familiar with the actress who played Alice Faulkner the ingénue role. She and Holmes share a very strangely chaste clinch at the end of the film that put me in mind of the edicts of today’s Bollywood features whereby we can’t see the female stars actually kiss. There are some bits that don’t really work. A ruse with a cigar ember in a dark room, which is a big moment in the play, doesn’t come across at all here. Plus, there’s a climactic confrontation between Holmes and Moriarty that’s jumpy, perhaps due to some frames being lost to time.